Decorating your home is an art. Rugs are crucial items in this endeavor. The color, shape, texture and size of a rug may make a room either bright or dull. Also of similar importance are rug pads, though many people ignore them. I like to call the rug pad the rug’s ‘sidekick’. Here is why a rug pad is a necessary addition to every home. 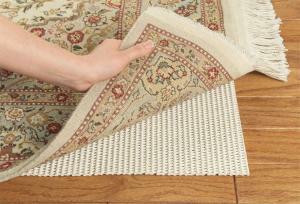 Rug pads have ridges that enable trapping of dirt that may be entrenched in the rug. The ridges also allow air flow between the rug and floor, therefore assisting in vacuuming the rug. You have kids or pets, right? Chances are that you occasionally encounter spillage. The rug pad helps in preventing the wet substances from reaching the floor surface. In the absence of a rug pad, dirt particles may accumulate under your rug. This sustained accumulation of dust damages the floor as it causes abrasions. Moreover, rug pads also prevent dyes from the rugs from staining your carpet in the event of a spill. Rug pads provide an additional layer of cushioning between the rug and floor, thus making the floor comfortable to walk on. They also absorb the impact of feet on the surface, hence reducing noise and enabling a peaceful environment. A rug pad aids in preventing the rug from curling or developing wrinkles. Rug pads hold rugs in place and maintain a firm grip. They prevent shifting of the rug when someone walks on it, in turn, preventing slipping. A rug pad is usually designed in such a way that it sticks to the rug and the floor. This happens especially when the rug has been placed on a surface like a tiled floor. In the absence of a rug pad, the rug may shift and grind on the floor. Over time, this leads to the premature ageing of the rug. Therefore, to prevent this, a rug pad needs to be present. There are several types of rug pads in the market. They are classified based on the materials they are made of. How to Determine the Right Rug Pad for you? Now that you know their importance, how will you tell which rug pads are the right choice for you? First and foremost, we have various types of rug pads in the market as stated above. Therefore, you need to know the size and thickness of your rug for you to get one suited for it. 3-foot by 5-foot and smaller rugs go hand in hand with a thin non-skid rug pad. If the rug is placed where many people pass through, the thin non-skid pad will come in handy to prevent slipping. Large rugs, probably 8-foot by 10-foot that are not prone to slipping can be accompanied by a ¼ inch rug pad or one that doesn’t have the non-skid feature. A good example of this is the felt pad. The felt helps in putting the rug in place. The recommended rug pad to purchase here is one that combines the felt and rubber features. ¼ inch rug pads are recommended for these types of rugs. In London for example, rug pads can be purchased from John Lewis Non-Slip Rug Holds and The Rugs Warehouse. Alternatively, purchases can be made online through Amazon and Argos. A dresser is also sometimes referred to as a chest of drawers. It’s a piece of furniture characterized by several parallel, horizontal drawers that are stacked one after another. Over the years, dressers have been known to be storage units for clothing like innerwear, socks and other types of clothing that are usually not hung in a closet. Due to their simplicity, dressers have always been overlooked in matters of home design (in this case bedroom design). In real sense, a dresser can also be a notable piece of furniture. Dresser types are typically classified under design; materials used to make them, and style. Here is a list of the types of dressers that can be found on the market. Which design types are there to choose from? It is also called Tallboy. This design is usually much taller than the standard horizontal design. It has a double stack of drawers comprising a column-shaped structure. It is also known as standard dresser design. It was molded from the chest, which is one of the oldest types of furniture ever made. It is horizontally oriented and usually has two columns of drawers. This type of chest is a modest form of the standard dresser design. Its main feature is a single column of drawers that ends up creating a narrow frame. They initially had a slanting surface for writing purposes, but the current trends have horizontal surfaces. This type of dresser is characterized by a single drawer column paired with a large, vertically oriented door. The door leads to a large cavity that allows for the hanging of clothes. This design is a combination of the standard horizontal dresser with a tall cabinet. This combination provides for more storage options. It is also known as semainier. It is characterized by a tall and long column which consists of seven drawers (a drawer for each day of the week). Of what materials are dressers made? Wood is obviously the most common material used in making dressers. 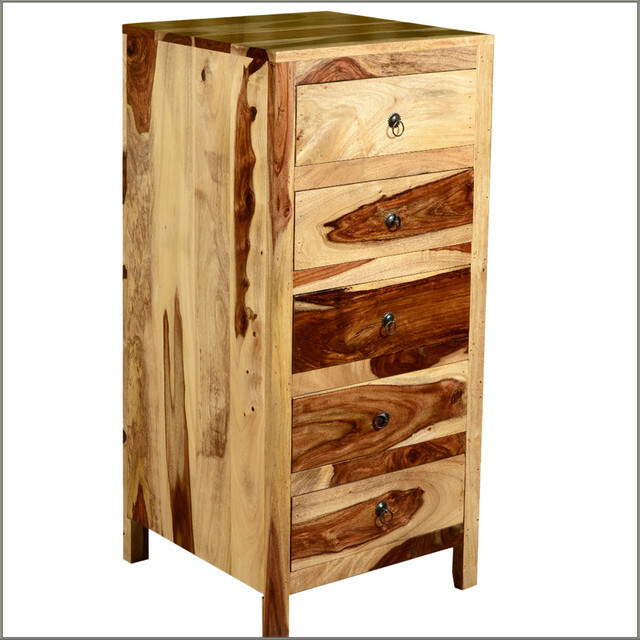 A huge percentage of dressers in various furniture stores have wood as their primary material. This material is not as popular as wood. However there are various dressers in the market made completely out of metal, with some having metal as the primary material and wood as a secondary material. Here, the framework of a dresser is made out of wood, and then leather is added onto the surface to form a rich, textural outlook. How many styles are out there to choose from? This style is characterized by a timeless comprehensive look that has carved wood structures with straight lines and a general shape. This style consists of dressers that are trending in this day and age. There is no predefined look for these dressers. This style consists of up to date designs that did not exist previously, unlike its traditional counterpart. 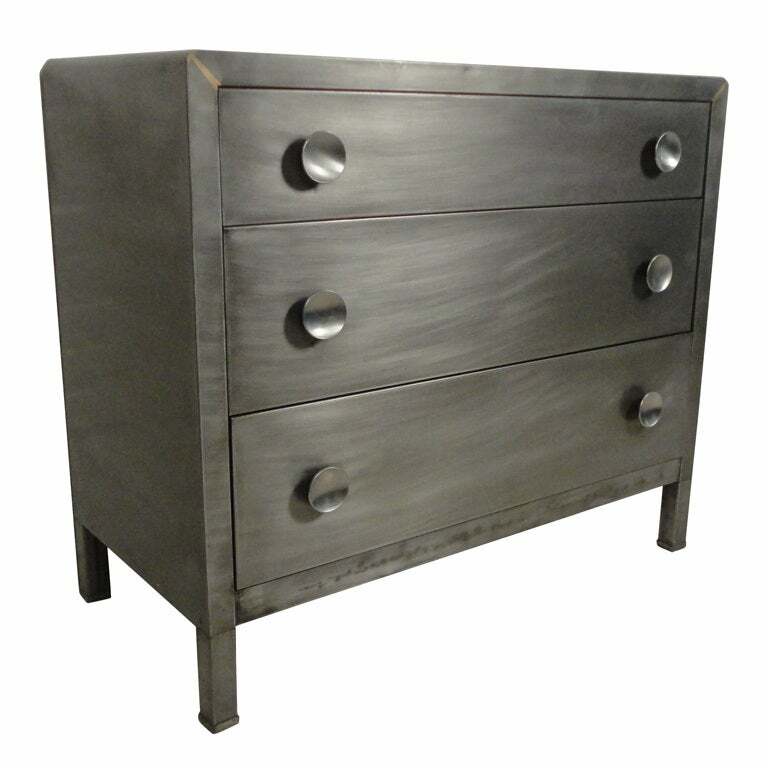 Dressers that come with this style are made of distressed wood, soft metal, and a utilitarian framing. This style embodies old-fashioned, handmade furniture. This style can be attributed to a type of design that has its origins in the 20th century and is characterized by clean, futuristic lines. This entry was posted in Home Decor on July 18, 2016 by admin. I saw some beautiful mirrors in a store here in London and just couldn’t stop staring at them. A whole bunch of mirrors, in different shapes and sizes. So I asked myself why not replace the plain mirrors I have with some of these gorgeous pieces? These mirrors will add a whole new dimension when it comes to wall décor. Before buying, however, I went and did some research (as always) on the various types of decorative wall mirrors. 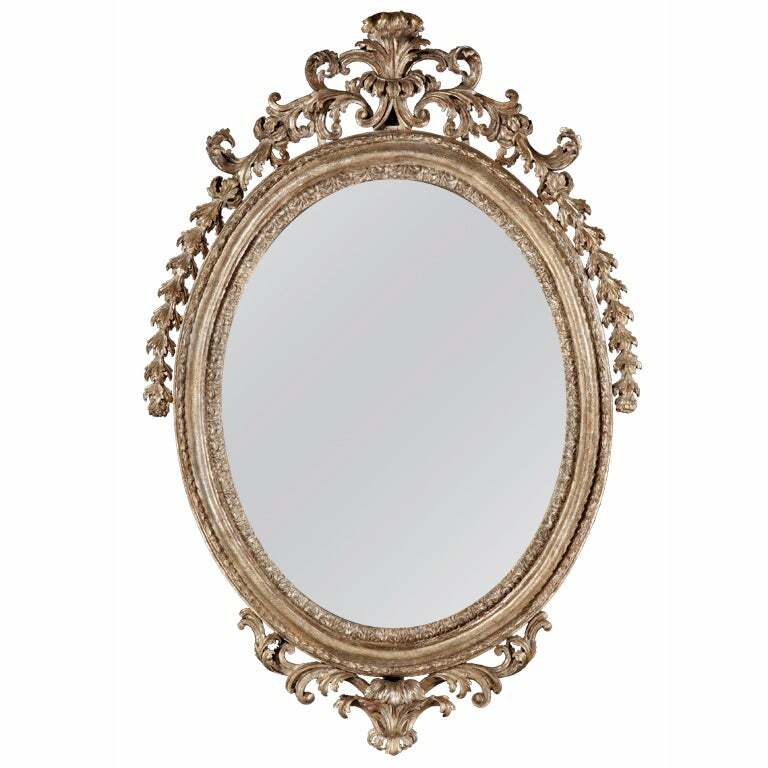 Like baroque furniture, these types of mirrors were highly carved and decorative. Baroque mirrors made in Spain were known to be big, bold, and echoed Spanish furniture that borrowed Italian designs. The Spanish mirrors had a Moorish style, and they mostly embraced various colours and foreign trends. They were the trend setters in Spain. They could even be found in churches and convents. French Baroque mirrors are epitomized by Louis XIII and Louis XIV styles. They were characterized by carved gilt wood frames with flowers, large pediments, and ebony. Their frames were irregular and marked a change in direction from Italian designs. Georgian England had a more limited catalogue of mirror designs than the rest of Europe. They reflected different styles; English Baroque, Carolean, Queen Anne and late Georgian Neo-classicism from the Adam brothers. An example of a frame design was the walnut frame that was characterized by scrolled edges. These mirror frames reflected the Georgian furniture designs of the time. These mirrors are all about their carving; from flowers to birds, ribbons, and feathers. Their surfaces were gilded just like Rococo furniture. While the 17th-century frames in Venice were termed as ‘glorified picture frames’, 18th-century ones were characterized by swags, scrolls, vases among other architectural designs. Empire style in France and the American Federal style depended on the Roman designs that were politically relevant to each nation in times of conflict. With regards to Napoleon, designs like the eagle invoked the power of the Roman Empire, while in America the same eagle designs communicated political ideals of patriotism and democracy. These were common during the Regency era, where they mirrored the black color scheme of the Regency furniture. They were rectangular in shape and also imitated some features of Greek architecture. They are considered unique in that they can be the central point in an entrance or areas with smaller spaces. They can also be used to decorate bathrooms and utilized as vanity mirrors in dressing rooms. They are mirrors that can be used for decorative purposes because they give an elegant and classy look. Most of them have unique carvings and can be used to contrast well with darker paints. They can be used as dressing mirrors in sections that cannot accommodate a wall mirror. They are also called full-length mirrors and are commonly used as dressing mirrors, but can also be termed as decorative mirrors. These mirrors can be placed in living rooms and also bathrooms. They can also be used as hallway mirrors. These are just but some of the mirror types. There are plenty more others in the market. This entry was posted in Home Decor on March 5, 2016 by admin. Windows – “little doors” hanging on our walls that we have all grown up with. At least, that’s how I used to refer to them growing up. Windows are so much overlooked, but their very essence will come beckoning at your doorstep when you discover their priceless presence. They bring life into a room in the form of fresh air and natural light. But, did you ever realize that they can be more than that, much more, especially to suit your interior décor tastes. Here`s a brief insight into some of the tips I`ve used for window designs in the past and had flawless outcomes as a result. The primary consideration here is the actual space the window will be contained in, in the wall. For massive, tall walls, the perfect match would be clearstory windows. They should be placed in a high position, towering the ground beneath them. An alternative to this would be to choose multistory windows which are a standard feature in atriums. For rooms with relatively shorter walls, a fair share of natural sunlight and the general scenery outside can be enjoyed by opting for windows that are low in height, about the floor. 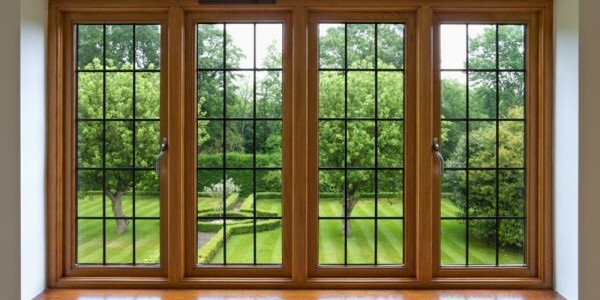 For those who can get involved in the design of their houses before the actual construction, I would urge you to consider getting windows that will bring your surroundings inside your home. What I mean by this is, perform a next to perfect sweep over of the world outside, choose the best view that you`d prioritize capturing, then choose a window that will bring that look to viewers from the inside. I will tell you from experience; nothing can beat the view of the sun showing its pink silk scarf on the horizon and its rays falling upon the ocean from your floor to ceiling glass windows. Leaving wall space mostly applies to the avid art collectors or anyone who has a preference for wall hangings and artwork. To such people, every inch of their wall space is valuable, and they need as much of it as they can salvage. Clerestory windows are their best choice for windows. They are placed near the roof to facilitate entry of natural light high above the level of the floor, all this in a bid to free up wall space below them. They also make the house appear like it’s hovering below the roofline. Did you ever think you could get so much…from a window? For most of the home décor items I’ve talked about on my blog, I`ve been careful to specify the best standards of measurements that have worked out for me. However, this is not the case for windows. Here, my one rule is,” there are no rules”. The essence of this is to help you choose different designs and configurations to bring out numerous variations depending on your style, taste, preferences and overall look of your home. The aspect of ‘no rules,’ gives you the freedom to choose from curvilinear to rectilinear types of windows, all for the purpose of taking advantage of the ravishing views outside. This entry was posted in Home Decor on January 1, 2016 by admin. The right combination of throw pillows usually gives a room a unique semblance. The first time I came across the concept of throw pillows, I fell in love with it. However, just like other people, I found it difficult to choose the ideal pillows when I first went shopping. The following are tips that guided me in choose the right pillows. If there are two pillows next to each other on a piece of furniture, make sure that they don’t look alike. For example, if one is patterned, the other should a single colour. For a large sofa, take two pillows that contrast its colour and put one on each end. Then the two middle pillows should have patterns that match the colour of the furniture. Prints that consist of neutral colours should be chosen especially if you like bold colours. Mixing of patterns is encouraged. However, most of the pillows should have at least one colour in common. 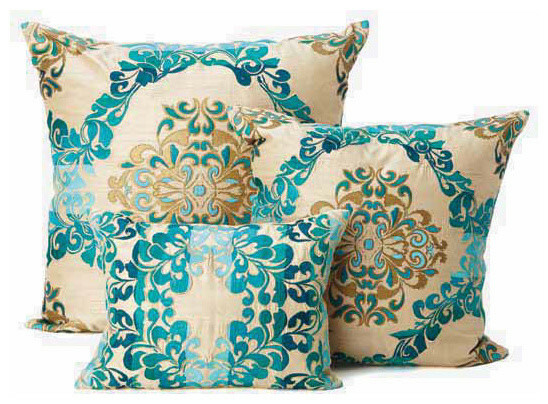 The scale of the patterns should be varied when mixing pillows so that each one can be noticeable. When buying pillows for both armchairs and sofas, make sure that they are in sets. 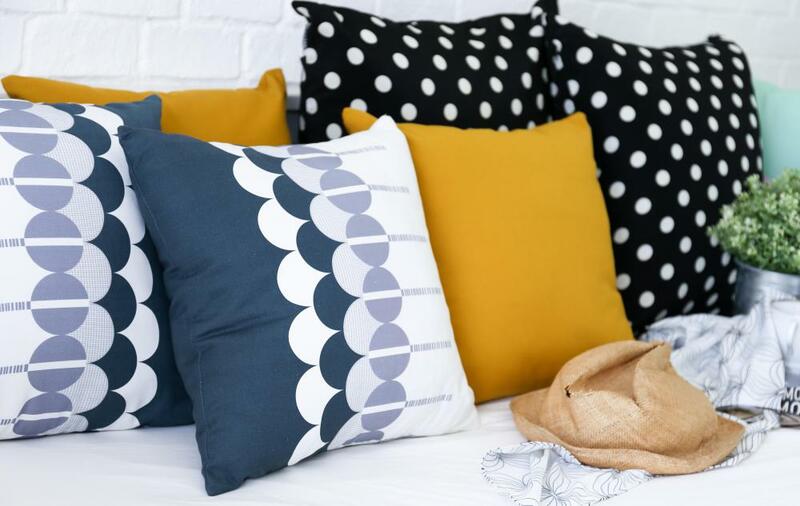 The pillows for both should not necessarily be the same, but at least match a few colours and patterns. The sofa or chair size should be the determinant of the size of the throw pillows. The average size of a pillow is around 16”-18” by 16”-18”, which is okay for a large sofa. Small pillows, on the other hand, will look weird on a large sofa. Oversize pillows (around 24”) usually create a cozy feel. However, they should be reserved for large sofas that have enough seating space. The typical pillow fillings are foam, feather or a synthetic mix. These are cheaper options, especially when you compare them to goose down. Goose down is softer and has better quality but is quite expensive. If the pillows are going to be somewhere they’ll be leaned a lot on; then it is advisable to go for the goose down filling to make the pillow last longer. If the pillows are not leaned on a lot, then go for the other fillings. The ideal number of pillows is at times a contentious issue. The most important aspect to consider is the size of the sofa. If you choose four pillows, then they should be in 2 pairs; one solid and one patterned. On the other hand, a huge sofa may require five pillows. Typically, the ideal number for most couches is three. For a small chair, however, one pillow is enough. There are basically four types of pillow shapes in the market; squares, bolsters, rounds, and rectangles. The shape required will be determined by the intended use of the pillow. For provision of comfort to the body, while lounging, squares are the best. Rectangles, on the other hand, provide support to the lower back and neck. The recommended shape for leather sofas is the bolster, as it doesn’t slip down. Also, sofas with sharp lines go hand in hand with round pillows, while large squares go with puffy couches. The room’s décor theme is a crucial aspect when shopping for pillows. It determines stylistic choices like fabrics, colours, and texture of the pillows. For example, velvet and silk go hand in hand with classic settings. Modern design schemes tend to go with a limited palette, large geometric prints or no prints and cotton and linen fabrics. For a dynamic look, each pillow can have a different fabric but with a common colour denominator. This entry was posted in Home Decor on November 13, 2015 by admin. The living room is a gateway to any home. This is where visitors spend the most time. It is, therefore, wise to invest in classic furniture that would make the room elegant. Sofas are one of the most common types of furniture in every home. I must admit I love sofas. I love to browse the internet to look at the latest sofa designs from around the world. I love to go out and try them whenever I’m shopping. However, this obsession has at times gotten me into trouble with my husband (laughs). I remember some time back we were in the city (right here in London), and I decided to make a stopover at a furniture store called Furniture Village in Friern Barnet. At first, my husband was hesitant but after persuasion, he reluctantly agreed. I ended up spending a huge amount of time in there trying out each and every sofa. This infuriated my husband, and I was almost left behind! So, there are many types of sofa sets available. So many, that it may be difficult to choose one from the other. Let’s consider a few. This sofa is renowned for its tufted characteristic. The tufted design in some sofas is confined to the back and arms, while in some, it’s included in the sitting area. With this type of a sofa, the back part comprises of pillows and is not joined with the frame. This design was created purposely to create a softer sofa with large cushions that are within its frame. Lawson sofas come in different sizes, materials, and colours. One can play around with the detached cushions, for example, by using them as pillows while lying on the carpet. This sofa is divided into several sections which can be arranged into several configurations. The most common number of sections is either 3 or 5. There are many styles, designs, and materials within the furniture market, some which are large while others are small. The most common configurations of this sofa are the U and L shapes. The main advantage of the sectional sofas is that they are easy to move (in case one wants to move them to another place or even relocate). Also known as The English rolled arm. It’s characterized by low arms and a high back. Another characteristic is its tight upholstery, although it is a bit cushioned all over (including the arms). Its main characteristic is the higher back at the center which descends in a continuous line into its arms. The legs, together with the wood on top of the back, are usually exposed. Its main design element is the continuous and equal height back and arms. The arms curve inwards, thus creating some sort of long line from arm to arm. Some cabriole sofas have the exposed wood element along the top of the back and arms. With this kind of sofa, the arms are rolled to the side and are lower than the sofa’s back. There are some Chaise Lounge Sofas that have an arm while other don’t. These sofas can be commonly found at pool sides as patio furniture. Its main characteristic is that it does not have a back. Therefore, it’s advisable to put it against a wall, allowing the pillows to provide a more cushioned back. It’s simply a wide chair and considered closely ‘related’ to the loveseat. However, the loveseat is broader than the settee. In London, sofas can be purchased at Furniture Village Friern Barnet, Furniture Village New Malden, and The Furniture Store. This entry was posted in Home Decor on September 14, 2015 by admin. Wallpapers are generally good for decorating our homes. They usually come in different textures types and designs. They are sold in rolls and put on walls using paste. They usually bring some kind of excitement to a room. I happened to visit a friend’s house that she had just moved into, and I was awestruck by the way the wallpapers she had placed on the walls of her living room, kitchen, bathroom, and bedrooms had made them magnificent. There and then I decided that I would try out wallpapers in my home to see how they would make it beautiful and appealing. Here are the different types of wallpapers available in the market. They are the most commonly used wallpapers around and can be used in any room. Designs that are printed on a paper backing and then a polyvinyl or acrylic vinyl topcoat is applied. They are easy to install and remove. The vinyl coating makes the wallpaper easy to scrub in order to clean it without ripping the paper. Very suitable for humid rooms like bathrooms and kitchens. This is because the vinyl coat allows the wallpaper to withstand moisture. As the name suggests, the designs here are pressed onto a paper backing thus creating a raised texture effect. This type of wallpaper can be put on walls that might be slightly damaged as the textured embossed patterns can hide some wall blemishes. Like the vinyl type, embossed wallpapers are easy to clean. Careful application of these wallpapers is needed in order to avoid curling problems afterwards. This type of wallpaper has a layer of fabric that is coated with vinyl. Coated fabric wallpapers, however, have a limitation. It’s not advisable to put them in rooms that have a lot of moisture, for example, bathrooms because they would not hold. A polished metal base is used to create shiny metallic wallpapers. Different designs are then printed on top of the metallic surface. These wallpapers are printed on three different backings. Which ultimately make a huge difference on wallpaper placements and removal. Most times, these shiny metallic surfaces illuminate flaws that might be present on walls. Therefore before installing the foil wallpaper, one must ensure that the walls are in good condition. Its major characteristic is the fuzzy velvet like texture, and designs are usually printed on a paper backing. When pasting this wallpaper, extra caution should be taken because if paste stains the front surface, the stain cannot be washed off. Since it’s un-washable, it’s not advisable to put these wallpapers in kitchens or kids’ rooms. This wallpaper is often very delicate and should be handled with care. When pasting, extra care should be taken because the metallic material at times creases and wrinkles. The walls should also not have any defaults. Foil Wallpapers are commonly used in kitchens and bathrooms. 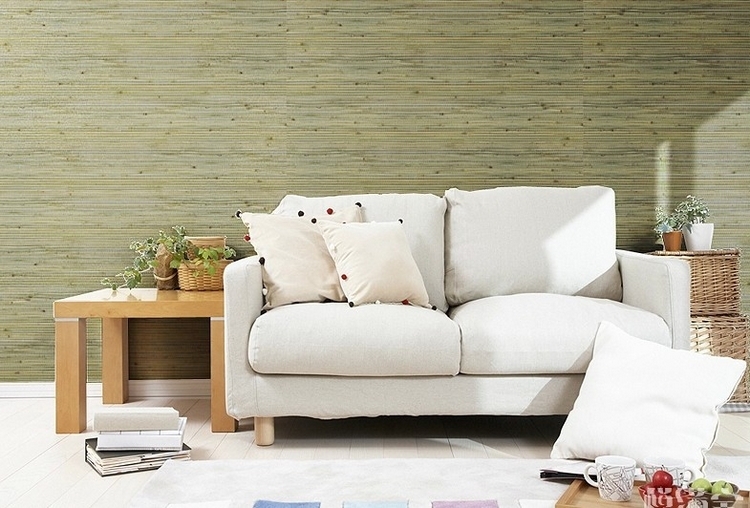 As its name suggests, paper wallpaper is entirely made of, well, There are no coatings whatsoever. Damages are likely to happen whenever attempts to clean it are made because it tends to tear upon coming into contact with water. This type adds a unique look to a room. It is commonly made by applying bamboo reeds on a paper backing with glue. Due to the bamboo reeds, the wallpaper will appear to form panels on walls. Natural Bamboo Wallpaper is however not washable. This entry was posted in Home Decor on June 8, 2015 by admin. A dining room table is typically the central point of a dining room. It’s where guests are entertained and families bond over meals. The dining room table is one of the pieces of furniture that is used the most; probably 2 or 3 times a day. Why not invest in a stunning table, one that stands out? My husband and I decided to take our time when shopping for the best dining table for our family. We ended up settling on a lovely, rectangular, wooden table that has wonderful patterns on top. However, this may not be your preference. Not to worry, there are very many types of dining tables to choose from. They are classified according to shape, material, origin and style. Let’s consider some types according to shape, material and style. This is the simplest design. Tables here have four legs with equal spaces between them. Because of their size, they are suitable for restaurants and other smaller places. Round or circular tables allow people to shift seat options. This is the most common dining table shape. This shape allows carpenters to try out different styles and designs. This shape is also common and popular, alongside the rectangular shaped table. It allows for the creation of lovely curves that have a longer surface area, hence increasing the space for more chairs. With this design, there is no specific shape definition. The table shape in this category is neither square, rectangular, oval nor round. This is the most commonly used material in the making of dining tables – a fact clearly evident when you walk into any furniture store. This tabletop is characterized by a multilayered composition that provides for a strong surface which is resistant to wear and tear. PVC laminated tables are the most common in this category. Tabletops made of metal tend to bring about a modern yet firm touch to a room. The main advantage of this type of tabletop is that the metallic material is resistant to stains. Additionally, it tends to be cool and is conducive for industrial areas. This material is often associated with floors and even kitchen counters. However, it can also be used to make fantastic dining tables. One advantage of this material is that it can easily be cleaned in the event of a spillage. Glass can also be used to make tabletops. They tend to bring about a stylish appearance within the dining room. The legs of these tables are mostly metallic. One advantage is that, like marble tops, they are easy to clean. Tiles are also a common feature of floors, but they are also used to make tabletops. They often create a beautiful and artistic appearance. As the name suggests, this table style is from way back, and still popular today. It’s characterized by detailed textures and carved wood. It’s characterized by clean lines and sharp angles. This style incorporates the use of wood in its natural state (unpainted) in order to create a nature like feeling. 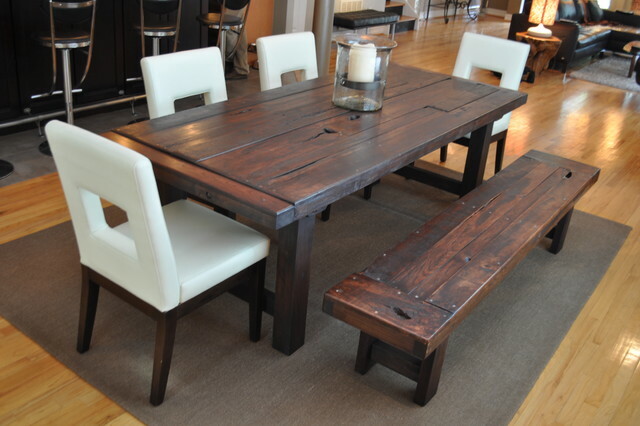 Tables made using this style are prevalent in cottages and cabins. Stores in London that sell different kinds of dining tables include Furniture store, Furniture Village, Mondital Luxury Italian Furniture Store and Harvey’s Furniture Colindale. This entry was posted in Home Decor on March 29, 2015 by admin.